The Berlin-based daily Die Tageszeitung is normally considered a bastion of political correctness. The paper, which was founded in 1978, has always seen itself as a left-leaning alternative to the mainstream press and is known for its outspoken positions on issues such as globalization, the environment and xenophobia in Germany. 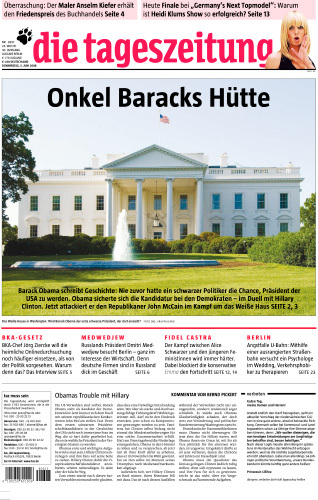 Hence readers were all the more surprised to see on the cover of the Thursday edition of the “Taz” — as the newspaper is commonly known — a photograph of the White House under the headline “Uncle Barack’s Cabin.” “The White House in Washington: Will Barack Obama be the first black president to move in there?” read the picture caption. The headline refers to Harriet Beecher Stowe’s 1852 anti-slavery novel “Uncle Tom’s Cabin,” which has become controversial due to its perceived stereotyping of African-Americans. The novel led to the expression “Uncle Tom” being used to pejoratively refer to an African-American who is subservient to whites. But many were clearly displeased by the Taz’s cover choice — including representatives of Germany’s black community, who reacted with indignation. “I find the Taz cover very problematic,” said Yonis Ayeh, a board member at the Initiative of Black People in Germany (ISD). The ISD represents the interests of black Germans, who are estimated to number up to 500,000 within Germany’s population of 82 million. The Taz has even sparked diplomatic incidents with its irreverent approach. Its depiction in 2006 of the Kaczynski twins, who were then prime minister and president of Poland, as potatoes caused a tiff between Poland and Germany (more…). Although “Uncle Tom’s Cabin” is well-known in Germany, ordinary Germans are not always aware of the controversy surrounding the book. Visitors to Berlin are often surprised to find there is even a subway station in the city called Onkel Toms Hütte, after a residential district which was named in tribute to the novel. WHAT’S YOUR THOUGHT ON THIS ONE?